I am happy to share the news that Kyna Leski’s story about her father’s role in designing the Metropolitan Opera House chandelier (see below links) has been documented and confirmed in the newly released movie “The Opera House”. World premiered at the Metropolitan Opera House last October, the movie opens in theaters this month. “The Opera House” presents Tad Leski -an architect and designer of the Metropolitan Opera House, a painter, and designer of Met’s chandeliers. It includes an interview with Tad Leski telling the story of Chandeliers’ origin and confirms his authorship. “The Opera House” is coming to theaters in January (13 &17), the same month in which Tad Leski was born! Concept Sketch by Tad Leski, Architect, for the Chandeliers of the Metropolitan Opera House showing the imbalanced asymmetry of the paint splash that generated its idea. My father, Architect Tad Leski, came up with the concept for the Metropolitan Opera chandeliers by accident while working on the design of the Opera House for Wallace K. Harrison . He was hurriedly finishing a perspective sketch of the interior of the Opera for a meeting of W.K. Harrison, John D. Rockefeller III, chairman of the board of Lincoln Center and Rudolf Bing, the general manager of the Opera House. In the rush to finish, a fat drop of white paint fell from the brush onto the drawing. The splatter extended across the image, resembling an explosion of fireworks. He thought it looked like refracted light from a chandelier, and added lines attaching the splattered droplets so that it would be interpreted to be the points light projecting from a chandelier. 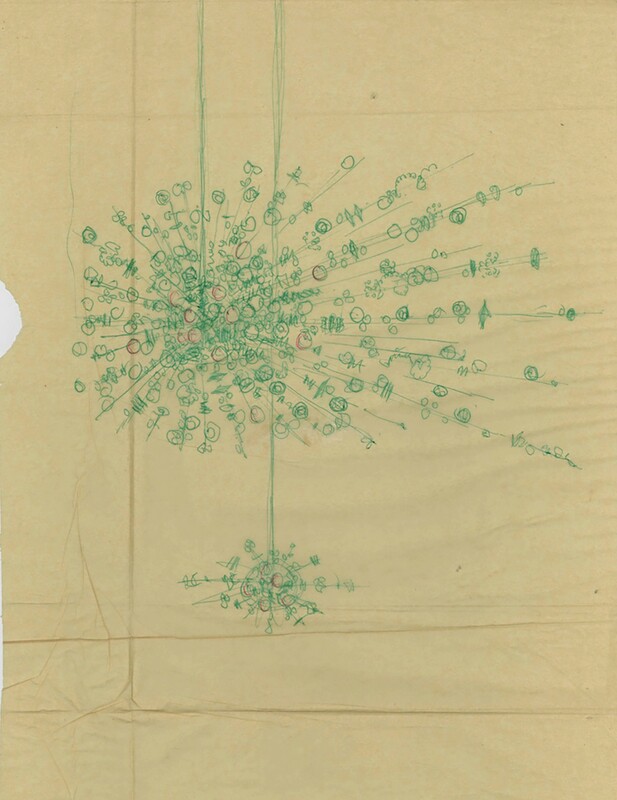 Rockefeller and Bing both thought the sketches were great and they particularly liked the idea of the exploded geometry of the splotch as the form of the chandeliers. A conceptual sketch of the chandeliers was made. A model of the central chandelier was made and both were sent to Hans Harald Rath of Lobmeyr. 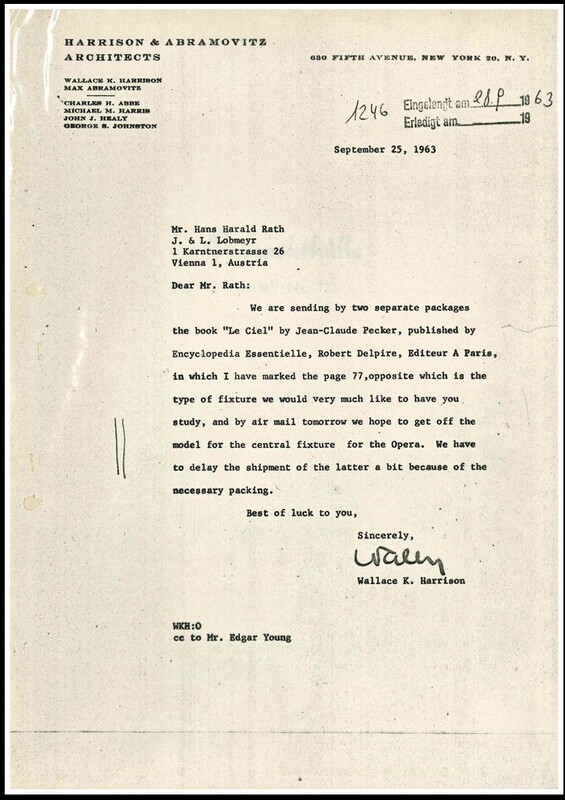 Wallace K. Harrison sent a letter to Hans Harald Rath in which Harrison refers to two packages being sent to Rath. The first package contained the book, Le Ciel, a text by the French astrophysicist Jean-Claude Pecker and the second package included a model of the central Chandelier. This points to the role of Lobmeyr as the fabricator/developer of a design that was already underway. 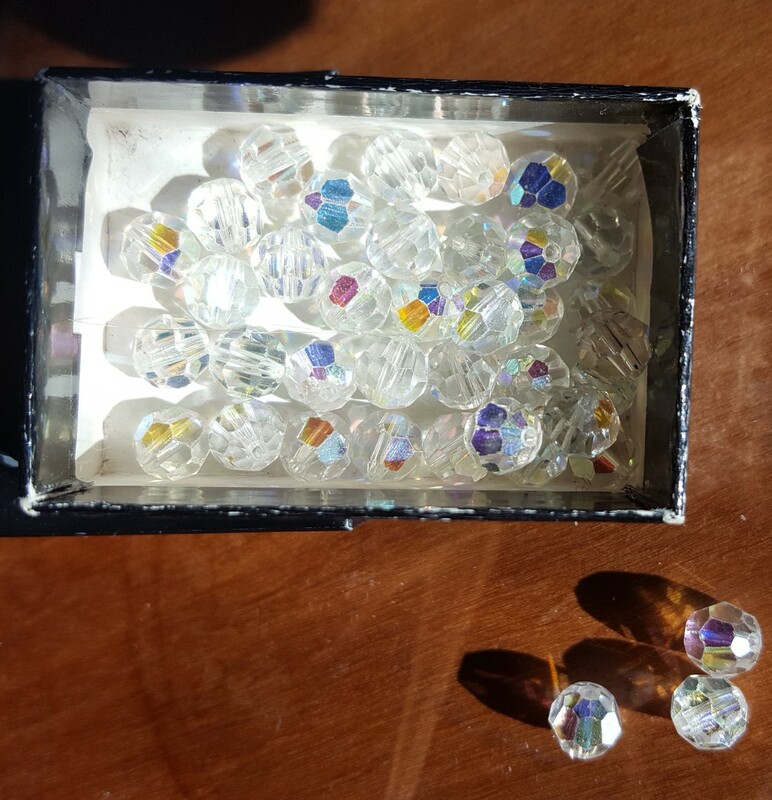 I have the miniature crystals  that were left over from the chandelier model, that were given to me, and my sister in the early 60’s. A NY Times article/slideshow, “The Space Age Story Behind the Metropolitan Opera’s Chandeliers,” (http://nyti.ms/1V3AuHU) by Alexandria Symonds contains a drawing of the concept of the chandelier’s’ design. This article attributes this drawing to Hans Harald Rath. This attribution does not stand to reason. (From here on I will refer to this drawing as the Chandelier Concept Sketch.) What follows is the argument why the Chandelier Concept Sketch was in fact made by my father. I believe that this sketch was included either in the first or second package sent by W.K.Harrison to Hans Harald Rath. In order to read the Chandelier Concept Sketch it is important to understand the idea for the chandeliers, how the idea evolved, and how it was translated into a suspended crystal and steel structure. As my father told, the initial idea came from a splash of paint on a perspective sketch. The expansive force of the paint splash resonated with the expansive force of the theory of the beginning of the universe, or “Big Bang.” In the late 50’s, early 60’s the debate between theories regarding the beginning of the universe was very much in the air as the first physical evidence of the Big Bang Theory was visible through the invention of the radio telescope. While an optical telescope shows the space between the stars as an empty blackness, a radio telescope reveals the cosmic radiation of the initial explosion as a glow. Harrison sent astrophysicist Jean-Claude Pecker’s book, Le Ciel, to Lobmeyr for meaningful inspiration for design development. Hans Harald Rath played the critical role of translating the expansive geometry, as drawn and modeled by Tad Leski, into the design of an object subjected to gravity on earth. Rath needed to express a radial force from a point out into space through a suspended object subjected to downward gravitational forces. Additionally, he needed to translate a sketch from an imbalanced collision into a careful, balanced placement of mass supported at its center of gravity. An admirable achievement. My father was an artist as an architect. Process generated the best ideas in his designs, and in this case, process included a serendipitous accident. His spirit as an artist allowed him to recognize a salient idea in the paint splash which fell on his drawing. In communicating this idea to Lobmeyr he would have to make drawings and models which expressed the concept that came from the paint splash, namely its expansive force and radial geometry. He knew nothing about the technical aspects of chandelier design, let alone the refractive properties of crystal or the structural problems in creating a hanging glass and steel fixture, etc. Nor was that his job. But it was his job to communicate through marks on a page a concept for design; specifically, here, the geometric properties of expansive explosive force. And that is what he did. 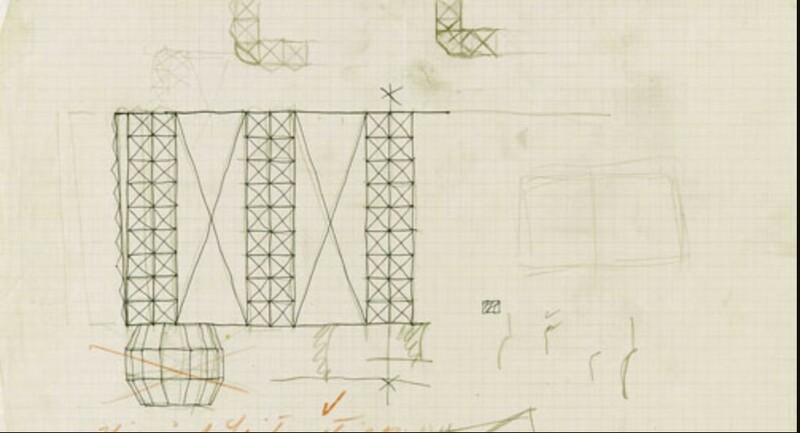 A key feature of the Chandelier Concept Sketch is its asymmetry. Collisions, explosions and paint splashes are not perfectly symmetrical. They reflect the particular forces that make them. The structure of hanging chandeliers however need to resolve the forces that act upon them. And the designs of Metropolitan Opera Chandeliers, as developed by Hans Harald Rath, are symmetrical. The roles played by my father and Hans Harald Rath intersected at the juncture between accident/discovery of my father’s creative process and the translation into and resolution of the forces and limits of Lobmeyr’s design development. 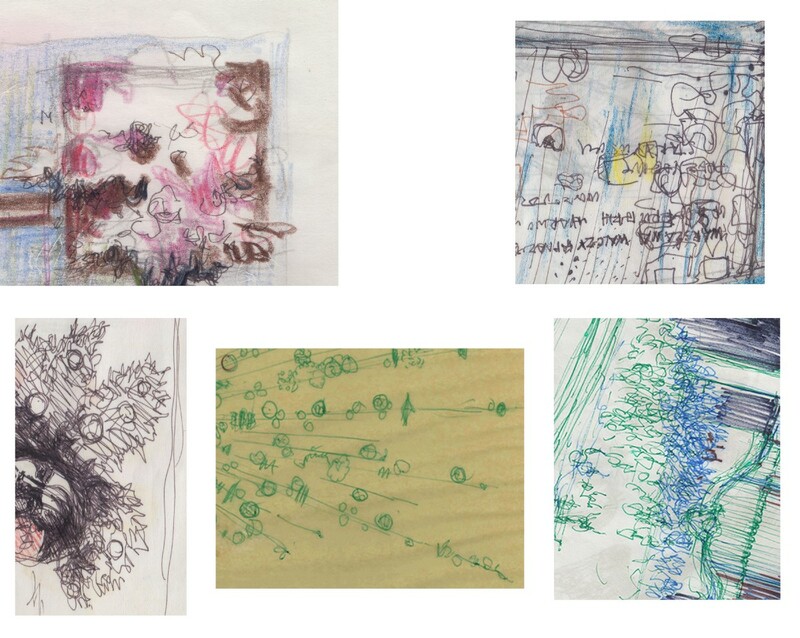 Details of sketches by Tad Leski showing his characteristically free marks. No lined or gridded paper or underlay in pencil was needed before making confident marks. By comparing sketches done by my father, seen here, and Hans Harald Rath, below, one can see two very different “hands” in the mark making. The difference in how the marks were made reflect the different approaches and purposes of the two men. My father worked with mixed media, informally using the materials at hand. His marks were gestural and free and showed a characteristically “loose hand.” He drew on trace or other blank paper so the the marks were unregulated by lines or grid of graph paper. Sketch by Hans Harald Rath from Lobmeyr website. If you zoom in on this image you will see that it was first planned out in pencil before the lines were committed to ink. Alternatively, Hans Harald Rath drew with a much “tighter hand.” His concern frequently reflected symmetrical geometry and measure. His marks were not gestural at all; but were more calculative by comparison. The use of the graph paper by Hans Harald Rath aided his calculation and he planned out his lines in pencil before committing to ink. This brings me to my contention regarding the Chandelier Concept Sketch, published by the NYTimes, and attributed to Hans Harald Rath. This drawing was clearly done with the purpose of communicating an expansive force as inspiration for a chandelier. It is not a drawing of the inherent issues for design development, such as locating crystal mass, locating and configuring structure and supporting cable. This drawing’s purpose fits the role that my father played in the chandelier’s design. It communicates the irregular forces of the paint splash. It is shows an asymmetrical order through marks, not a symmetrically organized arrangement of crystal and steel. Most definitely, it is the expression of its author, Tad Leski. Marks are an expression of the thoughts which accompany the making of them: This sketch shows explosive forces by starting with the initial point of explosion and then drawing out from the center along the radial line of force. This is why the “squiggles” appear. Helical squiggles are the result of drawing a circle while simultaneously drawing outward. The squiggles along the radial lines are literally the result of thinking of an outward force from the center. Gestures made while thinking of the idea — make marks. And that is how drawings are the expressions of ideas. This letter is from The NYTimes slideshow/article, “The Space Age Story Behind the Metropolitan Opera’s Chandeliers,” (http://nyti.ms/1V3AuHU) by Alexandria Symonds. An update: I asked John Cochran, Research Manager, The New York Times Style Magazine to correct the mis-attribution in the slide show which contained the above mentioned letter from W.K. Harrison to Hans Harald Rath and an image of my father’s Chandelier Concept Sketch misattributed to Rath. Cochran’s response to my request is that he spoke with Leonid Rath, grandson of Hans Harald Rath of Lobmeyr, who told Cochran that “(Lobmeyr) never received a model for the chandeliers from Wallace K. Harrison. So the second package either was not sent, or perhaps it was lost in the mail.” Leonid Rath claims the model of the chandelier simply and conveniently vanished. And John Cochran did not question Rath any further. Architects communicate design through drawings and models. The architects would not have said, “Oh well, our model didn’t arrive” and leave it at that. If Harrison & Abramovitz sent a package with a model of the chandelier to Lobmeyr and it didn’t arrive, you can be sure that a second model would immediately be sent. I have the miniature crystals that were given to me, and my sister, that are the same shape as those used in the Chandeliers but are about 5mm in size. My father gave us these miniature crystals in the early 60’s. They are the crystals used in the model of the chandelier which WKH mentions in a letter, would be sent to Rath. Originally published at medium.com on September 24, 2017.